Software-defined storage: The key to smarter storage management? Current data retention policies—which demand that data must always be accessible and immediately retrievable—make storage and management a monumental task. Architecting a traditional storage solution that provides enterprise-grade data accessibility, scalability, and performance can be challenging enough—but you also need to meet changes in these demands on a moment’s notice. Read this e-book to learn how software-defined storage (SDS) can not only resolve these data availability, capacity utilization and scale, and storage performance challenges, but also maximize the value of existing storage resources. 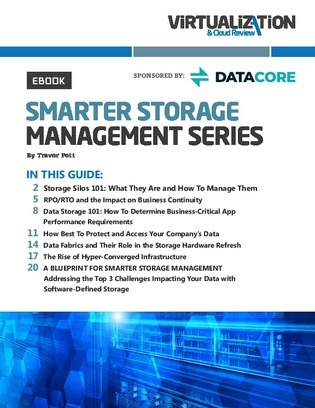 The e-book also features an article on how to best manage storage silos.